Found out this morning about 2 o'clock that my grandfather had passed away. The good news is he is dancing with Jesus at the throne of God! 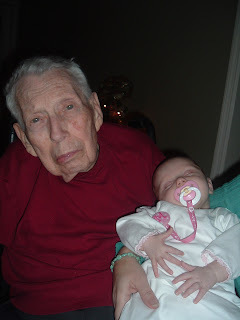 The last picture we took of him was from Christmas with our little Mary Katherine. He was 91 and had battled Alzheimers for several years. Funeral arrangements are tentatively scheduled for Saturday at 2 p.m.
You and your family are in our prayers Mike. God Bless! Sorry to here about your grandfather. My grandmother died of Alzheimer as well. You and your family will be in my prayers. Mike - Sorry to hear of your loss - if you need anything - let me know- we will be praying for you and your family. Thanks GUYS and GAL...I appreciate your concern and your kind words. Sorry to hear this Mike. We will keep you in our prayers buddy. As for you grandfather, he is seeing things we can only dream of for now. You are SOOOOO right about that Rick...I'm excited about the prospects of one day joining them! I hate to say this (in a way) but this is the most important post on your, or any of our, blogs.